aspects of contemporary individual and collective existence. A rather short CD, I was thinking, and perhaps at less than twenty-seven minutes maybe the shortest by the Mystery Sea label. 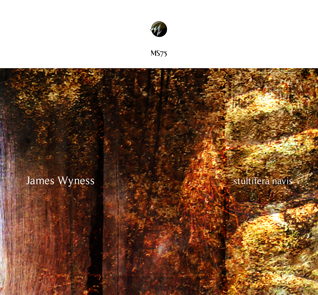 James Wyness‘ music was reviewed before (Vital Weekly 689 and 796) and he works with composition, live concerts, installations and such like. On his website he writes about his music “My compositional aesthetic converges on the materiality of sound, on compositional strategies informed by morphogenetic theories borrowed from the biological sciences, and on the behaviour of sound in space, an on-going concern in relation to multi-channel installation and theories of architecture. Sound sources typically range from field and experimental studio recordings to hand made acoustic and electronic instruments to found objects”, and this new work is an example of all of this. It’s one piece, but build from a variety of sound sources, such as Scottish ponds, Iberian geophonies, mountaintop chapels, and transmission masts, metal factory, hand bells and metal drinking vessels. That’s an interesting collection of sound material, some of which are water related – the usual guiding for Mystery Sea – and some not. Wyness creates a piece of music that is in strict linear build up, like we are crossing land along the straight line of a stream that goes through it. It is not a work of one sound being explored over and over again, but it uses a multitude of sounds, all at the same time, mixed together in a highly versatile way. Sounds move in, move away, move around, move out, and all of this in a nice vibrant manner. There is no standstill, but there is always a slow yet constant motion around these sounds. Multi-layered but with a fine clarity over these sounds, distinct and clear from each other, this is a great work. However with one thing to complain about: with less than twenty-seven minutes, this is actually very short; I wouldn’t have minded this to be thirty-five/forty minutes.